Social Media marketing was at a nascent stage a couple of years back. However, today brands have matured and are more than ready to accommodate Social Media marketing within the overall marketing budgets. They understand the threats of negative publicity on social platforms. In this day and age, if I come across a brand doing a shoddy job on social media, especially if the brand is popular, it comes across as a great disappointment. 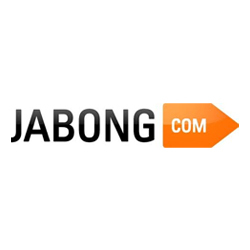 Jabong.com, a leading ecommerce brand has been upto multiple goof-ups on Facebook and Twitter. Not only has the brand jeopardized its brand image but is also running significant risk of losing customers. Running Facebook contests require ideas and innovation. 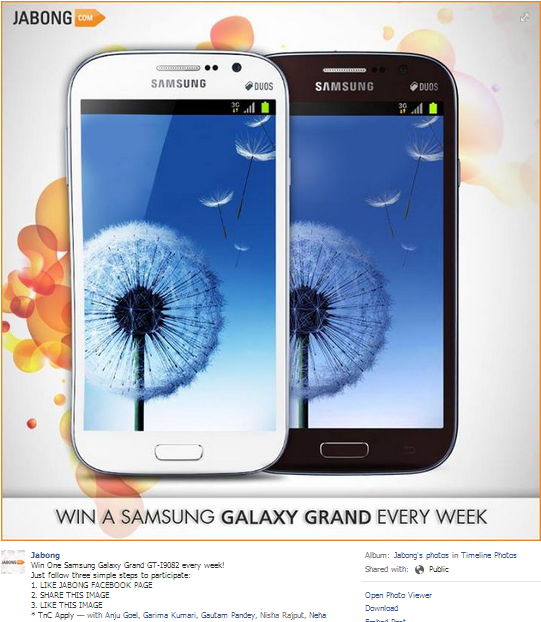 Win One Samsung Galaxy Grand GT-I9082 every week! On 12th August it claimed that the participants had only 2 days to take part. After 7 days, it declared that the lucky winner will be declared on 21st August 2013. Though, it did not mention where, when or how will the winner be declared, neither did Jabong bother to reply to the comments. Being selective in its reply to comments, it also managed to promote products through this post. 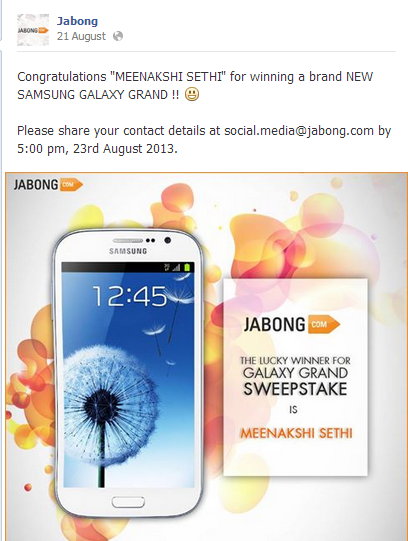 On 21st August it announced the winner through the Facebook wall. This contest is absolutely against Facebook guidelines. There is complete lack of planning and execution which clearly shows in the way Jabong handled comments. To start with, no separate tab has been created to run the contest. Simply mentioning TnC apply as a pointer does not substitute Facebook guidelines. Without stating the terms and conditions of the contest, how can the brand assert contest rules on participants? The contest began with no promotion or eligibility requirements, needless to mention that it does not deliver any value to participants as well as Jabong. Had the contest been run creating an application, they could have integrated Twitter with better planning. To add value, the traffic could have also been driven to the website. Such amateur attitude on social media can only be an outcome of handing over the marketing responsibility to a novice. Promotions on Facebook must be administered within Apps on Facebook.com, either on a Canvas Page or a Page App. You must not condition registration or entry upon the user taking any action using any Facebook features or functionality other than liking a Page, checking in to a Place or connecting to your app. You must not notify winners through Facebook, such as through Facebook messages, chat, or posts on profiles (timelines) or Pages. Jabong violated all the Facebook guidelines by running this contest. 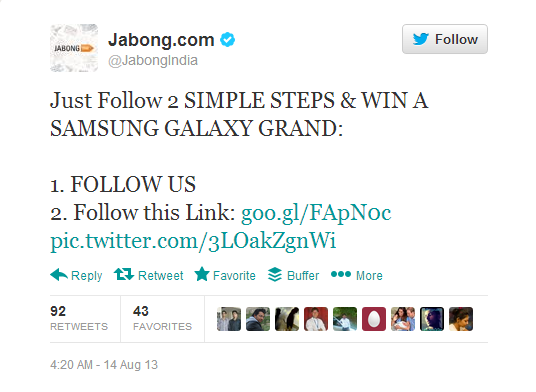 On Twitter, Jabong ran the same contest asking users to follow their account, once again, inviting users to win a Samsung Galaxy Grand on 14th August 2013. It also recently ran a quiz contest with the hash-tag #SuperRandomQuiz. The hashtag did not make any marketing sense for the brand since it was not a branded hash-tag. The quiz was based on Bollywood and was entirely irrelevant to the branding. The brand gained only 53 new followers on that day. An innovative campaign could have garnered many more followers alike the Tape-a-Tweet campaign by Bournville, which lasted a day too and was successful Twitter contest. A few days earlier, I also came across a fishy post and comment on Jabong.com’s Customer Support application on Facebook. A user posted appreciating words for the brand and within a few minutes, the user replied to the post thanking her own post on behalf of Jabong. Whether or not Jabong planted these posts and comments or the user herself did it, is a mystery. A brand like Jabong should revamp its strategy else the huge community sizes on each platform will be deemed worthless. It doesn’t matter how frequently brands are reminded to follow Facebook guidelines, when it comes to running a Contest or a sweepstake, but they will still not conform. Page admins must start taking Facebook Guidelines seriously; else you can definitely make these bloopers for your Facebook contests and get your page deleted.